Cartier La Panthere is aimed at independent women, strong and rebellious. 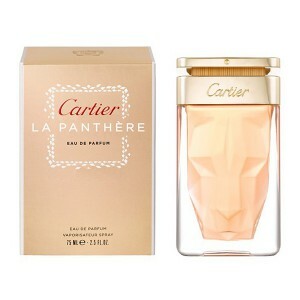 Cartier La Panthere 75ml. Eau De Parfum is an expression of freedom. A sensual fragrance that will become daily muse and inspiration. A symbol of elegance, recalcitrance and absolute independence. Aroma suitable for a dignified and refined women who know very well what they want. Cartier La Panthere has a fruity and woody character. In addition to animal musk also feel a pleasant tones of gardenia, over which exempts strawberries, dried fruit and rhubarb. Refreshing intoxication, which belongs to the modern fragrance with a very original expression. Accompanied by the sweet aroma of flowers. Luxury vial of Cartier La Panthere boasts an exclusive design, which is a harbinger of elegance, originality and superiority. Perfumed fragrance for women grounded every passerby and you practically into shape your outer outfit. Bold and sensual combination that is worth it. Fragrance was launched in 2014. The fragrance of flowers and the smell of panther exuded united in flavor La Panthère - allegories of femininity from Cartier, endearing wit and freedom. The fresh scent of gardenias inspired perfumer to create a fragrance that leaves a clean, seductive trail with a hint of animalistic, in whose heart is a live panther lurking, ready to seduce sensuality stunning sun-filled loop. Unbridled passion, but at the same time floral scent attracts, like a glance of the unruly beast in the world. More Theophrastus and Dante sang panther, not only for its grace and inexplicable mystery, but also for its seductive scent. As is known, the panther - the only animal with a natural incredibly pleasant aroma. But this natural secretion laid a death trap: panther hunts from ambush, and exuding a magnetic scent lures its prey. Bottle La Panthère - a true masterpiece of minimalist design and very Panther, frozen like a precious stone, carved into the magic bottle thicker.